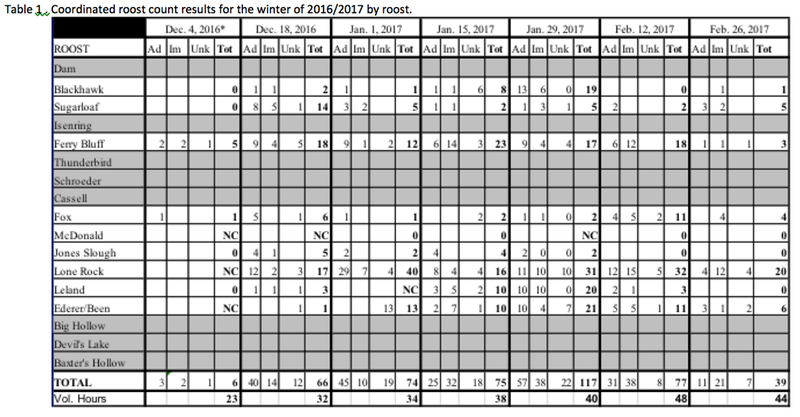 On February 26, 2017 you collectively tallied 39 eagles through 44 volunteer hours invested (Table 1). This was our last count of the winter season and it seems as though we just got started. Uff-da! I want to provide a special thanks to staff of Wisconsin Department of Natural Resources who came out with us on each count at Ferry Bluff to help. These folks were: Travis Anderson, Mike Dampf, Dan Goltz, Sara Kehrli, Matt Seguin and Meghan Ziegler. 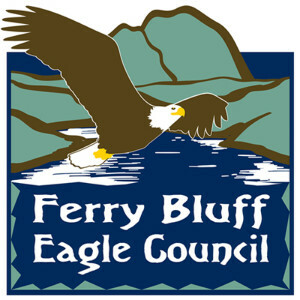 Due to the closures in parts of the Mazomanie Unit off Laws Drive we would not have been able to count the most used portion of Ferry Bluff Roost without the help of these dedicated individuals doing extra effort on the eagle’s behalf. You also would not be reading these words without the assistance of Jennifer Niles. Jen took over from Heidi Royal and formats these reports as well as manages our distribution lists – things that I cannot do so well. Thanks to all of you! Almost all the counters described two basic things in their reports to me on Sunday. Eagles came in late and people saw almost twice the number of eagles flying about as they saw actually going into roosts. On such a warm evening there were good soaring conditions, the warm sun probably engendered many courtship flights (many such flights were certainly noted by counters), and there wasn’t much reason to use communal roosts other than, perhaps, from habit or for other reasons like seeing where other eagles would venture out for food in the morning. It certainly is proper to only count eagles actually landing in roosts because eagles that fly over and then off in other directions could always return to the roost minutes or hours later. Eagles could also overfly one roost like Blackhawk and fly on to Sugar Loaf or even more distant roosts such as Ferry Bluff. The only way to minimize double-counting is to only count birds landing in the roost. On warm nights like this, however, that means that many eagles may simply perch in trees near where they found food and not go into a roost at all. That way no eagles will follow them back to their food source – there are costs to communal living. There is, therefore, no perfect rule for counting. Our counts yesterday probably under-estimated eagle numbers by 10-30%. Of course, many eagles are also drifting further north to get back to their breeding territories sooner. Part of our low count was also likely due to eagles moving out of our winter area. A sign of migration can be seen in the large proportion of immature eagles counted yesterday. Excluding unknown-aged birds we counted twice the number of immatures than adults yesterday. 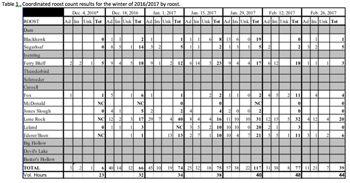 Compare that result to counts from December 18, 2016 or January 1, 2017 where adults outnumbered immatures 2:1 (Table 1). Of those adults not departing for northern clines, many were and are focused on nesting already. Adult eagles are incubating at nests near Highway C/Highway 60 and at the nest across from the end of Grand Avenue. 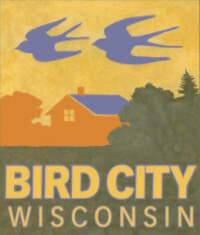 Has anyone seen nesting activity at the nests near Ferry Bluff, Culvers HQ or Kransfelter’s Island? These adults will not be flying into communal roosts either, making our count even lower. You know, the overlap between nesting and wintering eagles is still a very new situation. It has been occurring to any extent for only a decade or so. How territorial eagles interact with non-territorial winter eagles is an unknown. Marge Gibson (REGI) believes that intra-eagle strife is growing as is the number of injured eagles that result from territorial conflicts. Interestingly, extensive conflict between wintering and nesting eagles in Sauk Prairie is not yet obvious. There is more to learn. (Please click on the image below for full size viewing).